Hi friends! I'll be heading up I-5 from my California home for three concerts and two workshops in Portland, Oregon & Seattle and Bellingham, Washington this coming weekend. For this year's "Banjo in America" shows, I'll be bringing even more banjos than usual, including a prewar flathead '30 Granada and a '30 flathead style-3 Gibson, a Cole Eclipse and Vega Whyte Laydie #7 from the early 20th century and three Jim Hartel 19th century banjo replicas.. My banjo workshops are topics oriented: "Working Up Fiddle Tunes" and "Up The Neck Back Up." Tab examples will be provided for everything that I teach in both sessions. These are open to all levels past total newbies and it's likely that there will just be a few folks in these sessions, which makes it ideal for lots of one-on-one teaching at these sessions. Friday, January 18: Portland, OR, The Banjo in America at Abbie Weisenbloom's Amazing House Concert series in Inner SE Portland. Potluck at 6:30 p.m., concert at 7:30. Suggested donation is $15-25. Contact Abbie at 503-233-4945 or abbiew@froggie.com for info. Reservations recommended as this show often sells out. This concert will also be broadcast live on Concert Window at 8 p.m. Pacific Time. You can watch from anywhere you have an Internet connection! Click on the Concert Window link to be taken live to Abbie's living room! Saturday, January 19: Portland, OR, Bluegrass Banjo Workshops at Claire Levine's in NE Portland home. "Working Up Fiddle Tunes" from 10 am to noon and "Up The Neck Bluegrass Backup" from 1 to 3 p.m. $45 each session. Reservations required by emailing to clairel2002@yahoo.com or phone 503-830-3453. Sessions are open to all levels past total newbies. Saturday, January 19: Seattle, WA House Concert at the home of Carolyn D'Albora in North Ravenna, 8 p.m. concert, doors at 7:30. Suggested donatoin $25. Email dalboras@gmail.com or phone 206-245-0875 for reservations and info. Only ten seats remain for this performance. Sunday, January 20: Bellingham, WA, Nancy's Farm, 2030 E Smith Road, 2 p.m. concert. Suggested donation $18. Contact 360-739-5651 for reservations. Thanks folks! I'll attach a full description of the Portland workshops to this post for you to check out. Licks-ercises for Bluegrass Banjo: Scruggs, melodic and single-string - a new Homespun 2 DVD set! California Banjo Extravaganza with Ryan Cavanaugh & Riley Baugus, Nov 12-15: Concerts + Banjo Camp! Alan Munde & Bill Evans Pacific NW Concert and Workshop Tour Continues! Jan 27-31! Seattle and Portland workshops and concerts - and live Concert Window broadcast! July 12 and 13th! A Prairie Home Companion Banjo Special, Saturday, February 23rd!!! Southern California Concerts & Workshops (Blythe, Culver City & San Luis Obispo), January 18-20th! "The Distance Between Two Points" music video now up at YouTube! New CD "In Good Company" with Stringdusters, Tim O'Brien and many others now available! Gryphon Stringed Instruments Banjo Workshops in Palo Alto, CA coming up Saturday, January 21st! Dec 4th Banjo Hangout Workshop: "Upper Level Earl: Scruggs Techniques for Advanced Players"
bevans has 406 friends. View entire friends list. Paul Elliot & Bill Evans playing "Garfield's Blackberry Blossom"
Bill Evans & Ned Luberecki play "Home Sweet Home" and "Sliver Bells" at the same time! Bill Evans plays "Clinch Mountain Backstep"
1930 TB flathead Gibson Granada, converted to a five-string with a Frank Neat neck; a 1908 Cole Eclipse, a 1908 Whyte Ladie #7, three Jim Hartel minstrel replicas, 2 Osborne Chiefs, 2 Deering, and 1 ekonting! Hey, they're all related to my job! The Beatles, The Osborne Brothers, Earl Scruggs, Jim Hall, Bob Dylan, Tony Trischka, The Weepies, Alan Munde, Charlie Haden, J. S. Bach, Ornette Coleman and many, many others! Currently listening to Sonic Youth, Bob Dylan, The Bee Eaters, Chris Pandolfi and, always, Earl Scruggs! I've been playing banjo professionally since 1976 and am thankful for the many great experiences I've had playing bluegrass and the many folks that I've met along the way. I am lucky to count among my mentors and teachers such great players as Tony Trischka, Bill Keith, Alan Munde, J. D. Crowe and Sonny Osborne.<br><br> I teach private lessons to students at all levels out of my home in Albany, CA and present workshops literally all across the world. I have three solo CDs available, "Native and Fine" (1995) on Rounder, "Bill Evans Plays Banjo" (2001) & "In Good Company" (2012) on my own Native and Fine Records label. My most recent releases are "Fine Times At Fletcher's House" (2013) and "Songs That Are Mostly Older Than Us" (2016), recorded with the late Chattanooga, Tennessee fiddler Fletcher Bright. I also appear on CDs by Dry Branch Fire Squad, Suzanne Thomas, the Bluegrass Intentions and Due West. I love teaching, whether it's groups or individual folks. Chris Pandolfi (Infamous String Dusters), Greg Liszt (Bruce Springsteen, Crooked Still), Eric Yates (Hot Buttered Rum Band) and Jayme Stone are among some of the professional players that I've helped over the years. I've produced four instructional DVDs for AcuTab Publications, three DVDs for Homespun Tapes and one for the Murphy Method. 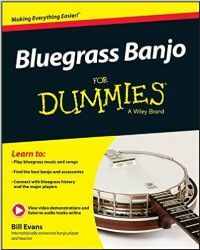 I've authored a few books during these last several years, including "Bluegrass Banjo For Dummies," "Banjo For Dummies," "Parking Lot PIckers Songbook, Banjo Edition" and "Absolute Beginners Banjo." I also teach at several camps each year, including the Swannanoa Gathering and I produce my own camp, the New Mexico Banjo Camp, in April of each year. You can learn more about me and access my touring schedule by visiting www.billevansbanjo.com.